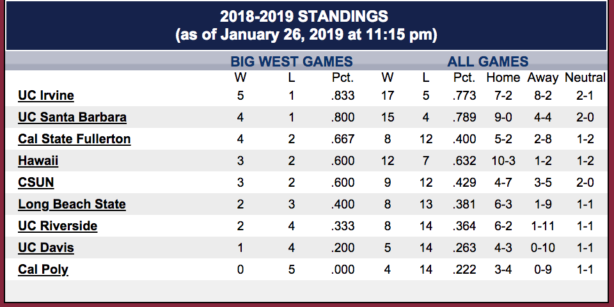 If the University of Hawai’i basketball team wants to make a move up the standings of the Big West Conference, this week could be a crucial one. 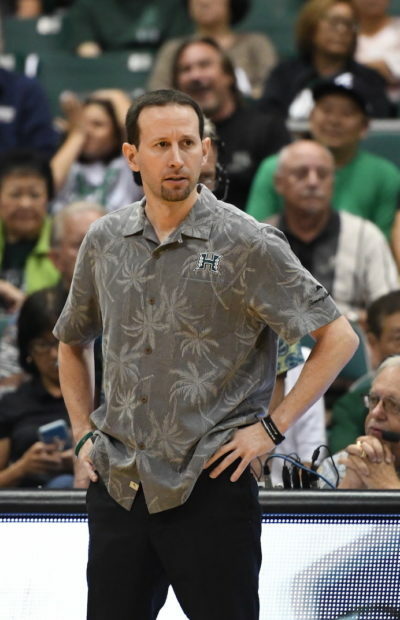 The Rainbow Warriors will host Long Beach State on Thursday and UC Santa Barbara on Saturday. Hawai’i is 12-7 overall and currently tied for fourth place in the Big West at 3-2. Long Beach State is 8-13 and 2-3. However, the 49ers are the only Big West team that can claim a victory over current first-place UC Irvine. Long Beach beat UCI, 80-70, on January 16 at Irvine. UCSB is 15-4 and 4-1. In what could work in Hawai’i’s favor, the Gauchos will host UC Irvine in a showdown for first place on Thursday night in Santa Barbara. The Gauchos will then, presumably, travel to Honolulu on Friday. Pending outcomes earlier in the week, the UH vs. UCSB game on Saturday could become a battle for first place. Head coach Eran Ganot understands the importance of both games this week, and said large crowds at the Stan Sheriff Center will make a difference. University of Hawai’i Athletics is offering free admission to furloughed U.S. Government employees who were impacted by the government shutdown. Federal employees may receive free tickets to the men’s and women’s basketball doubleheader on Saturday, Feb. 2 and men’s volleyball match on Sunday, Feb. 3 at the Stan Sheriff Center. Federal employees must show their current valid government ID to receive up to four tickets per event. Tickets will be available at the Stan Sheriff Center Box Office on game days, 90 minutes prior to game time. In addition, employees and their guests can redeem food vouchers for a free hot dog and 20oz. soft drink per person courtesy of Sodexo. Tickets are subject to availability and seat locations vary by event. The offer is not valid on previously purchased tickets. Other restrictions may apply. It is looking like the top and bottom are starting to separate. UH definitely belongs in the top half. Irvine is in first for now but UH was kicking their butts for most of the game before the meltdown at the end. If UH can win both games this week, they will have a great shot at the title. They always have a bad match ups with Long Beach, so lets see how that one goes first.